Appropriate for brightening up Raksha Bandhan celebration, this Feel-Better Gift Pack of Devilishly Good Best Brother Chocolates complemented with a free sacred Spiderman Rakhi, Roli Tilak and Chawal, will cast a charming spell upon the moment. The pack contains 18 Pcs of Chocolates. The design of the Rakhi may vary. Best Brother Chocolate Pack (18 Pcs) with 1 Spiderman Rakhi and Roli Tilak Chawal. 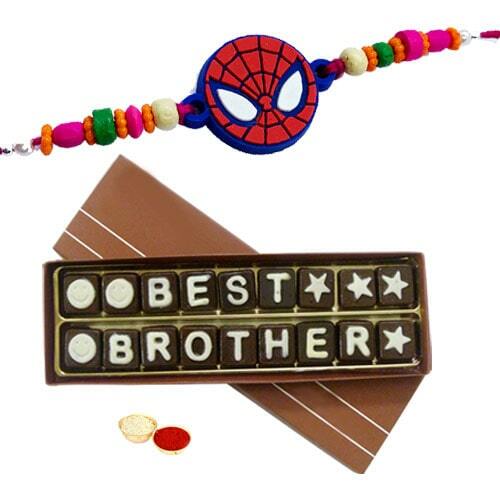 Best Brother Chocolate Pack (18 Pcs) with 2 Spiderman Rakhi and Roli Tilak Chawal. Best Brother Chocolate Pack (18 Pcs) with 3 Spiderman Rakhi and Roli Tilak Chawal. Best Brother Chocolate Pack (18 Pcs) with 4 Spiderman Rakhi and Roli Tilak Chawal.